Remus Exhausts Systems (from Austria) are designed to lower the weight, increase performance by 8-10hp, and add a deep throaty tone to your K1200RS or GT. Pirates' Lair offers 2 complete systems for the 1998-2004 K1200RS or 2002-2004 K1200GT. They are designated as the "Revolution" series and furnished with oval canisters. The EU approved Revolution features a removable insert baffle to tone down to a near stock noise level for those who want a more "stealthy" sound. The removal of the baffle will produce the full rich deep REMUS sound we all have come to appreciate. The incredibly light Titanium or Carbon Fiber systems weigh in at 17 lbs. . FYI.. The factory system (with catalytic converter) weighs in at a porky 34 lb. 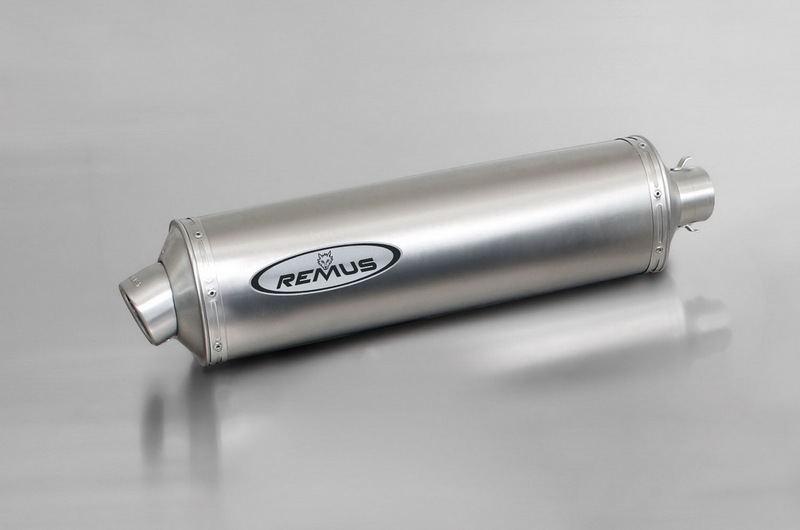 All Remus systems come with both the header and canister and eliminate the catalytic converter. As with other products in the Pirates' Lair product line, we offer competitive prices on the Remus Exhausts and full customer support. Call 828.628.7093 EST or e-mail for availability before ordering. Heads up!.. 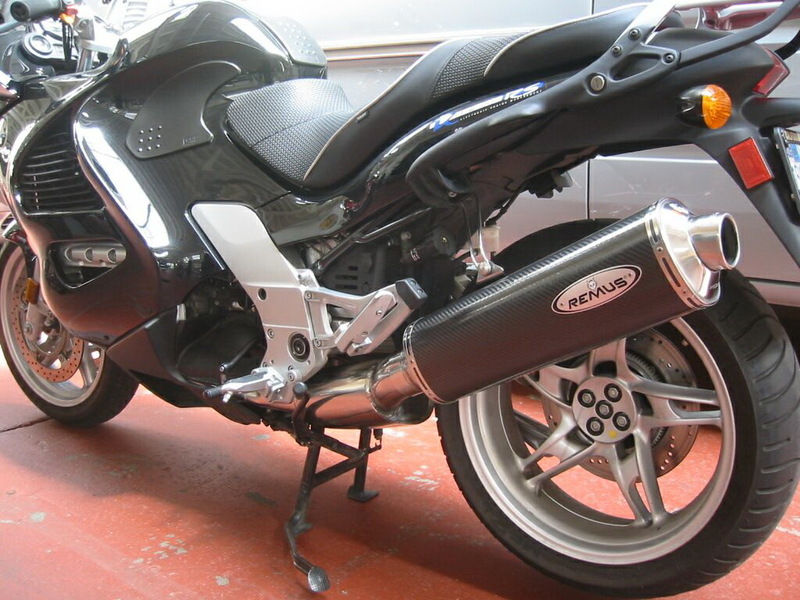 Since Staintune discontinued their K1200RS / GT offering in March 2014, Remus is the only manufacturer still making exhausts for the venerable BMW K1200RS / GT or K1200LT. FREEBIE GIVEAWAY! Here ye.. Here ye.. Pirates Lair is giving away a Free Pirates Lair Tee with every exhaust system sold while supplies last. Just ask at time of order and we'll either include your tee with your shipment or ship separately. Just let us know what size you want at time of order and we'll make it happen. If we are out of the size you want we'll ship the next largest size. You can choose any color you want as long as it's black. Supplies are limited. 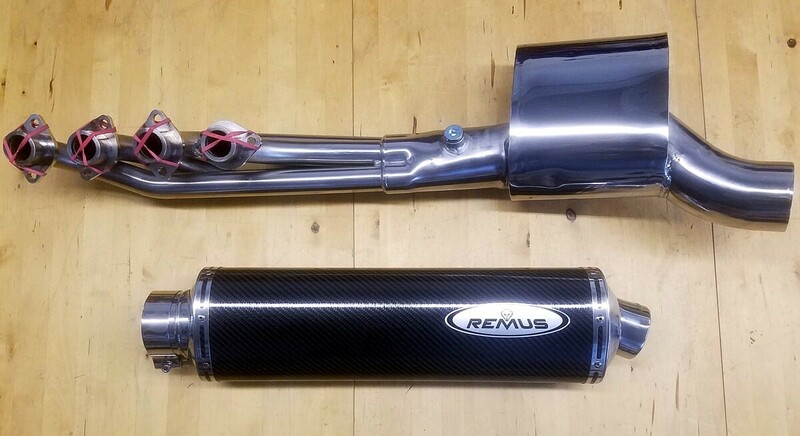 Remus Revolution K1200RS / GT Titanium Oval Full System Complete $ 1499.US (Shipping Included) Discontinued by Manufacturer 08/14/18! Remus Revolution K1200RS / GT Carbon Fiber Oval Full System Complete $ 1499.US (Shipping Included) Discontinued by Manufacturer 08/14/18! Note: There will be a handling/processing fee imposed on ALL phone orders over $750. This does NOT apply to PayPal purchases or personal checks. FYI.. PayPal is a FREE and 100% secure service where you can use your credit cards, debit cards, and even send money directly from your bank account. When price shopping keep in mind that our prices INCLUDE shipping charges. Most places DO NOT.